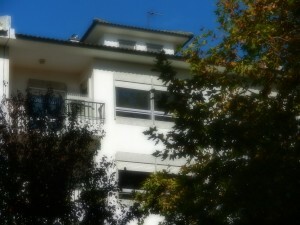 The apartment is situated on the 3rd floor of a quiet, neighbourhood complex. It’s just a two minute walk from a discrete shopping centre and a well stocked supermarket. And only a 5 minute walk from the beautiful, sandy Carcavelos beach. The nearest train station is in Carcavelos, on the scenic Lisbon to Cascais coastal railway line, and it’s only an 8-10 minute walk away. Free car parking is available in front of the apartment. The local, long, sandy beach with its friendly bars and an extensive range of restaurants and cafes is so inviting. 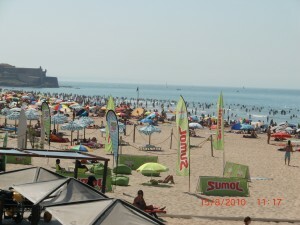 There are sun shelters and beds for rent, toilets, showers, a tourist office and lifeguards. It’s also accessible to people with disabilities. Bicycles can sometimes be hired from the nearby Riveira hotel and local maps are supplied with them. Hotel residents have first call on them however. The hotel also advertises a ‘Rent a Bike’ service associated with www.passeiosecompanhia.com at 18Euro/day (08.00-20.00). Helmets are provided.